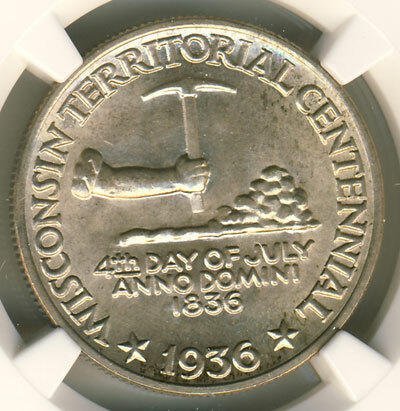 The 1936 Wisconsin Territorial Centennial Commemorative Half Dollar is one of the more common classic commemoratives, despite its rather low mintage of 25,000 pieces. The coin celebrates the 100th anniversary of the creation of the Wisconsin Territory in 1836. Wisconsin would later join the Union and become the 30th State of the United States in 1848. Issued by the Wisconsin Centennial Coin Committee, this was one of those issues that was not abused by businessmen, investors or committees, and distribution of the entire mintage was free and fair. As a result coins remained available at original issue price for almost a decade after the coins were initially released, and if you were willing to pay a little bit more Wisconsin Commemoratives could easily be acquired even in the 1950s. Wisconsin, located in the Northern United States bordering the states of Minnesota, Illinois, Iowa, and Michigan, has been settled for thousands of years by Native Americans, mostly subsisting on hunting and gathering. Initial European visits to the region were mostly French fur trappers and traders, starting in the 1670s, and a small number of Jesuit Missions and Forts were signs of European presence in the area by the end of the 1600s. During the following century both the French and the British, active in trapping and trading with the Native Americans would settle a number of outposts and storehouses for fur, but larger scale permanent settlements would not come until later. In the 1720s and 1730s the Fox Wars saw fierce fighting between the French (and their Indian allies) and the Fox tribe, which was reduced to only about 500 members. Wisconsin remained largely undeveloped by the time the United States acquired the region following the Treaty of Paris in 1783. The Wisconsin Region first became part of Indiana Territory in 1800, and Michigan Territory in 1818, but settlement was delayed for a few more decades. The first delay in American settlement had come because the British still controlled much of Wisconsin by the time the War of 1812 was fought, and some fighting was seen in the region. The Americans did not gain full jurisdiction until the Treaty of Ghent following the War, after which the British left. In 1827, the Winnebago War was fought, a minor war that strengthened American control in the region. The final blow for the Native Americans in the region came with the 1832 Black Hawk War. Fought from May to August of 1832 in present-day Illinois, Michigan and Wisconsin, the War was an attempt of Black Hawk, a Sauk leader, together with Native American tribes including the Fox and Kickapoos to resettle land in Illinois that had been ceded to the United States in a disputed treaty back in 1804. The war, fought on the American frontier far away from much of the American population, saw fierce fighting and left 500+ Native Americans dead, along with 77 American soldiers and settlers. The Indians were outnumbered and overpowered, and the end of the war meant that the region was now open for American settlement. American settlement came, and it came quick. Four years after the Black Hawk War was fought the Wisconsin Territory was created, and over the next 15 decades the population in the region exploded. While only a few thousand white people called the region home by the early 1830s, that number had increased to over 30,000 in 1840 and multiplied ten times over the next decade, with an estimated population of approximately 305,000 people by 1850. Settlements had initially been created around lead mining in southwestern Wisconsin, but by the late 1840s old trading posts such as Milwaukee had grown into cities with a large sustainable population. To celebrate the 100th anniversary of the establishment of the Territory of Wisconsin, the Act of May 15, 1936 authorized 25,000 commemorative half dollars to be issued. Benjamin Hawkins is usually credited with the design (his initial H appears on the reverse), although he merely modified original designs by David Parsons. The obverse features a modified version of the Wisconsin Territorial Seal, showing a miner’s arm holding an axe and a pile of lead and soil. Below this is “4TH DAY OF JULY/ANNO DOMINI/1836, indicating the day the Wisconsin Territory was created. Around the design is WISCONSIN TERRITORIAL CENTENNIAL and near the bottom is the date, flanked by two stars. On the reverse is a badger, standing on a wood log. The badger is the Wisconsin State Animal, a reminder to the early days of lead mining in the state when miners lacked proper housing, and had to dig themselves in like badgers in the winter to survive. Behind the badger are three arrows (representing the Black Hawk War) and an olive branch (representing peace). IN GOD WE TRUST is found between the arrows and the olive branch. Above all this is E PLURIBUS UNUM and UNITED STATES OF AMERICA, and at the bottom is LIBERTY and HALF DOLLAR. The coins were offered for sale shortly after being produced at the Philadelphia Mint in July of 1836. The issue price was $1.50 each, which was dropped to $1.25 each if ten or more pieces were purchased. Even though sales were less than the number minted (as evidenced by the availability of pieces as late as the 1950s) none were returned to the Philadelphia Mint to be melted. As a result uncirculated pieces of this issue are easily found to this day, including pieces grading as high as MS66. In fact, price differences between circulated pieces and pieces graded MS66 is minimal. 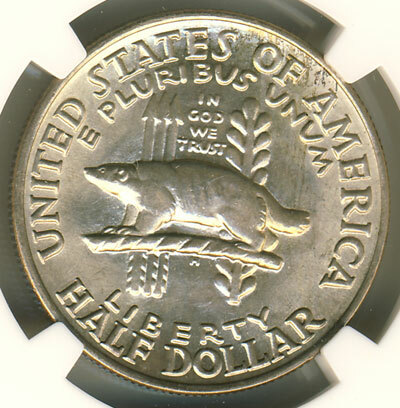 MS67s become a little bit more difficult, as the beaver on the obverse is prone to show hits, and finding a “clean beaver” (one with minimal surface abrasions) can take some time, especially when paired with good luster and eye-appeal. Both PCGS and NGC have certified numerous examples as high as MS68, a grade in which this issue is not as difficult to find as some other issues from this period.